Several stories of a parking garage at the historic Watergate complex in Washington, DC collapsed on Friday morning, reportedly injuring at least one person. Authorities responded to the office building and hotel shortly after 10 am ET after a supposed structural collapse occurred inside the garage. A local NBC News station said three stories had fallen in, citing a spokesperson for DC Fire and EMS. Emergency crews described the incident to a local Fox News affiliate as a “catastrophic collapse,” and Tim Wilson, a spokesperson for the DC Fire Department, said it may have been construction-related. One person was injured, according to local media, and taken from the scene by emergency personnel. As of 11 am, a fire official told journalist Ryan Reilly that all construction workers on the scene had been accounted for. "I was installing a panel," construction worker Gabriel Gresczyk told the NBC station. "I was looking out and I heard a rumble, and a 40-foot-by-40-foot section of earth just went down, hitting the floor below it, and then that floor went down." "One of our guys had just come up from that area, using one of the restrooms down there," he said. "Thank God he's all right." 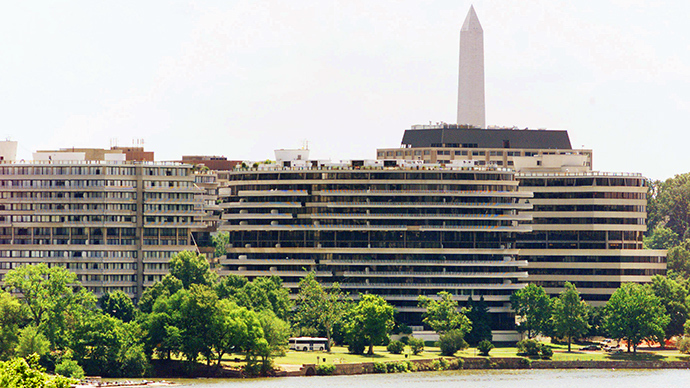 Completed in 1971, the Watergate achieved international notoriety the next year where the Democratic National Committee’s headquarters there were burglarized. A subsequent investigation indicted the administration of President Richard Nixon in the affair, prompting his resignation in August 1974. It was not immediate clear what type of construction was being done in the parking garage at the time of the collapse, but Euro Capital Properties, a real estate company with offices in Paris and New York, said last year that it would be putting $125 million worth of work into the building in 2015.